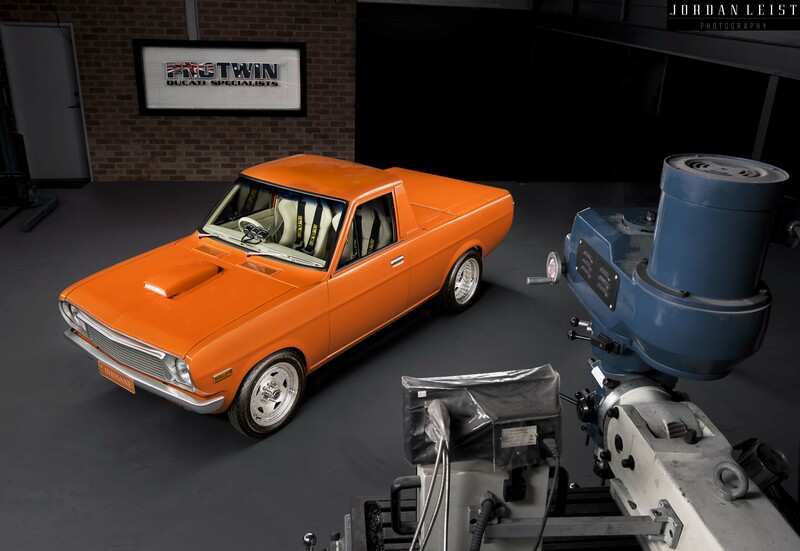 Justin Klashorst would be the first to admit that his immaculate Datsun 1200 ute hasn’t seen enough action over the last few years – nowhere near enough and it is a real shame because the car is quality from top to bottom and deserves to be in the spotlight some more. He has owned the car since he was just 16, the same amount of time he has owned is stunning, Group C kitted VH Commodore. Initially, the ute was purchased purely as parts chaser during the build of the Commodore, but Justin became a little too attached to it. It wasn’t long before the little rig was tidied up, a CA18DET donk slotted in and it became a great little cruiser. The funny thing is – the poor old Commodore was still in pieces! Painted in solid orange, rolling on ROH wheels and being a whole heap of fun to drive, Justin decided even though the car was cool, it really needed a ‘proper’ build so the whole thing was stripped and the second build commenced back in the early 2000s and took around two years to complete. Justin is one talented man, he has done his time in the field of modified motorcycles, specialising as a machinist and a fitter but over the years, he has taken his skills to a whole new level – building complete bikes, tuning all makes and models and even performing custom turbo installations. For the last ten years he has been running his own business – Pro Twin Australia, specialising in his number one love, Ducatis. With such an impressive skill set that includes building engines, welding frames and machining components out of solid billet, the second build was always going to be something remarkable. “I pumped a lot of hours into the car, I can tell you that. I would do a full day working with the bikes, and then it wasn’t rare for me to be back at my workshop working on the Datsun until 2 or 3 in the morning. The odd thing, it never felt like work, it was enjoyable to get the time on the car. I knew I was building something pretty cool,” explained Justin. One thing that Justin was never happy with the first time was the panel and paint. “That was something I won’t forget in a long time. A week after I got the ute back after the first build, the body filler started falling out of the car. The guy’s preparation under the paint was atrocious. I gave him all the panels, and he delivered me a heap of junk. I told myself that wasn’t going to happen again, so I started doing a lot of the work myself and then had my mate Yogi take control after. I knew I could trust him.” The Datsun’s body is far from standard too – the filler cap, door locks, tailgate latches and the rain channel were all removed for a smoother look. VH Commodore wheel arches were then welded onto the rear guards to allow for some bigger rubber. The top edge of the tray was also trimmed as were the rear bumperettes. Justin then had the rear of the cab extended by 5-inches to accommodate the roll cage loop. The chrome-moly half cage makes its way through a Lexan rear screen and into the floor of the tray. It was Justin who created the two-piece tonneau. “I was inspired by the late model Commodore stuff – they taper flat in the middle, towards the back. It opens in half so I can reach the fuel tank to fill it,” explained Justin. When it came time to paint the car, Justin still liked the orange but thought it needs some more boom, so the Tangelo Pearl from HOK was chosen to give the old girl a whole new lease on life. That aero pro-stock bonnet scoop was all the rage back in the day, heck, I even had one on my RX3, but Justin tells me it will be getting the arse soon. Inside the car is something else too, another mate Brad did Justin a massive favour on the job, and he was also a major influence on the build too. “Brad looked over the car and told me some places that I could improve on and made some suggestions about the build. He was full of enthusiasm with the car, and I appreciated his efforts. The work he did on the interior is just perfect. For what I paid, he went above and beyond on doing it right.” Plenty of leather has been thrown around the cabin – over the Velo race seats (that Justin had to shave to fit) over the custom door cards with the embossed design on them and around the Momo Corse wheel too. Justin then got busy with some fresh aluminium and hand-crafted the window winders, all the dash knobs and switches, the billet pedals and the centre cap for the steering wheel. I am sure I missed some custom stuff in there, sorry Justin! Justin chose to stick with the CA18DET mill from the previous build but of course, took things above and beyond once again. The crank was given some attention, with Crower H-Beam rods and Wiseco forged pistons completing the rotating assembly. Factory dialled cams, hydraulic lifters and the ported head all play their part too. Justin got busy on the lathe this time, creating a steel flywheel for the back of the crank and a billet harmonic balancer for the front. He also made the pulleys and the adjustable cam timing gears. From the lathe to the TIG welder, Justin grabbed some mandrel bends and created the tuned length exhaust headers and the large plenum intake manifold. He also created the complete custom exhaust which is rather unique – from the turbo, a 3-inch dump pipe runs to the rear of the car, and from the wastegate, a 2-inch pipe also runs the length of the car, flaring out to 3-inches before it exits at the back. This gives the car a fully functional twin system when the wastegate is screaming. A Garrett GT30 turbo provides the boost and is controlled by a MoTec M48 Pro ECU. Recently, Sean from Allstar Garage has been enlisted to tune the car and has managed to squeeze just on 400hp at the wheels from the machine. Justin reckons there is a little more left now that the car is running E85. Slotted in behind the little four-banger is a Silvia 5-speed at the moment but since the latest tune, Justin has managed to hurt that ‘box, so the plan is to either run an RB25 or 26 number which should be stronger. The shortened Borg Warner rear end runs 28-spline Moser axles and 4.11 gears. Once again, Justin proved just how clued up he is by using Stanza front struts that he modified to accept the adjustable coilovers and Koni inserts. To convert the car from four-stud to five, Justin machined alloy hubs for the front end and grafted them to Honda Legend rotors which wear Landcruiser 4-pots. The rear brakes are Commodore units. The rear leaf springs have been moved inward 50mm each side to allow for the 15×8 ½-inch rims to tuck under. The other Centerline Convo Pros measure 4 inches up front. At the shoot I couldn’t believe just how good the car still is all these years later – sure it has been stored away but you can tell the car was built properly and with such a high-level of quality that it won’t ever change. I have known Justin since the first build of the car, and I have always been a fan of what he has done. Seeing the car again reminded me of the ‘good old days’ and seeing his workshop, and what he has created with his business, well I was super-impressed and couldn’t be prouder of my old mate.